The CollectionView is a powerful tool for organizing data, and the new ComponentOne Studio for Xamarin ships with a brand new version of the popular control. The C1CollectionView provides a method for grouping, sorting, and filtering data, and the newest release brings this powerful ability to many new platforms. Both Xamarin.iOS and Xamarin.Android have their own unique controls for interacting with a list of data (the UITableView and RecyclerView respectively), and we've added new CollectionView libraries that make it much easier to connect these controls directly to your data. Why would I want to use a CollectionView? A .NET style CollectionView let's you greatly simplify some interactions with your data like filtering, sorting, and grouping. These functions aren't commonly supported by data collections, and a CollectionView wraps around your data to provide this functionality. Also (for iOS users) we are talking about a different type of control than what you might think of if you consider a UICollectionView (which is a very different UI component for presenting data). Rather the CollectionView we're describing has more in common with Microsoft's control.aspx) that was originally a part of WPF. Our C1CollectionView is a non-UI component that provides support for the functions we've described above, as well as additional support for cursor collections that allow you to incrementally load data. The newest release makes it easy to connect your data to the native list types of UITableViews and RecyclerViews. Regardless of whether you're going to be working in Xamarin.iOS or Xamarin.Android, the first step will be to add the right NuGet packages to your project. C1.CollectionView is a cross platform library that be used in Xamarin.iOS, Xamarin.Android, Xamarin.Forms, and even other .NET projects potentially. It performs all of the work you'd associate with a .NET style CollectionView. 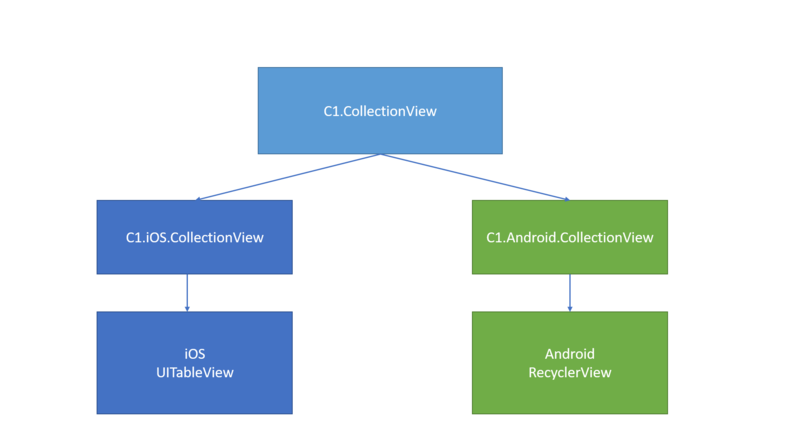 After this you'll add another library that acts as the connective tissue between the native lists types: either C1.iOS.CollectionView or C1.Android.CollectionView depending on platform. There are more samples available on GitHub that further illustrate further uses including using the sorting, grouping, filtering, and on-demand loading to great effect with live data from YouTube. 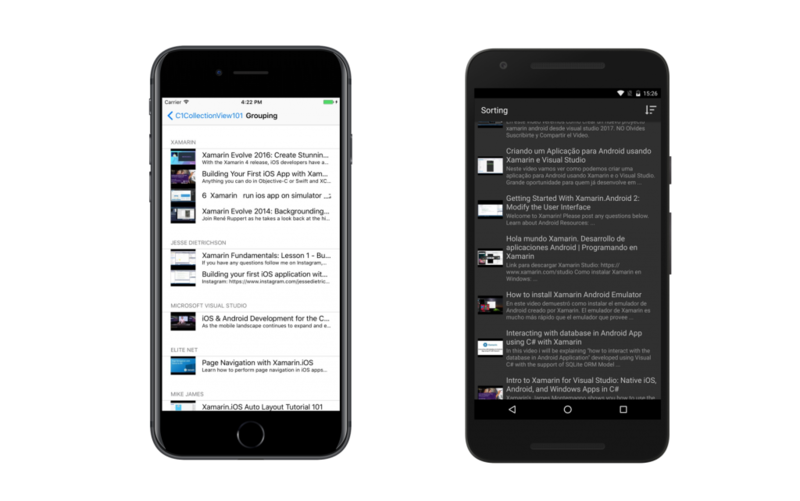 There are also more samples available on GitHub that demonstrate deeper functionality on Android including using the sorting, grouping, filtering, and on-demand loading with live data from YouTube. We're also excited to our new CollectionView has .NET Standard 1.1 with this release so it's even more portable than it's been in the past. As we position our Xamarin controls towards more and more platforms, we're happy to embrace similar expansion for our non user interface controls using .NET Standard as a platform.